To provide a foundation for systematically monitoring and protecting important sites and areas of cultural and natural significance throughout KNP. The KNP CIMS will be a data and information management tool provides the means to record, store, search and summarise important data of various types (e.g. document, photos, video, files) relating to cultural heritage places, objects and knowledge. This tool is only be accessible to individuals that have been registered and assigned a username and password. A mapping interface permits spatial features (e.g. sites, areas, tracks) to be entered or loaded into the system. For data items that do not relate to a particular location, non-spatial collections can be established. Once these basic features are created within the system, a wide range of related data items and custom-designed forms can be entered. This will effectively create a “keeping place” of cultural heritage information. Each feature and data item entered into the system requires permissions to be set, thus controlling which other groups of users will be able to see the information. 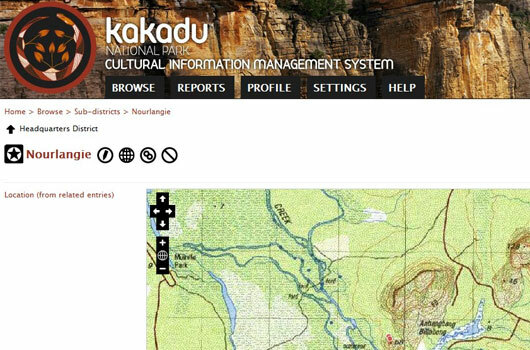 In future the KNP CIMS will also be used for operational/management purposes, with users entering forms relating to the maintenance or state of cultural heritage features. The system will have the capability of reporting back to managers on any sites, areas or objects requiring maintenance or monitoring.